I promise I’m not making a statement here, just thinking out loud. Last week my wife and I were talking about what we want to do with our kids academically when they get a bit older. A couple thoughts came up during those discussions. Most of us aren’t fans of parents who view youth workers as the primary source of spiritual formation for their kids. While many parents probably know they are called to be the primary spiritual influence of their kids’ lives, many still outsource that to the “paid professional,” the youth pastor at church. And even though we say we don’t like it, we still enable it and accept that responsibility in various ways. Is the norm of sending kids to church and outsourcing their spiritual formation primarily to a group teacher at church influenced by parents’ perspective and expectations of the cultural norm of outsourcing their kids’ academic formation to a group teacher at school? If so, is it okay to outsource your kids’ academics to a “paid professional,” but not their spirituality? An argument could be made that kids are formed much better spiritually when done by the parents in the home (that was true in my case growing up), but is this also true when it comes to their education? I realize that the academic system is so ingrained into our culture, society, and way of life, that to question it will automatically bring criticism from many people, similarly to how many of those in our churches react if we push back too hard on who’s responsible for the spiritual formation of teenagers. 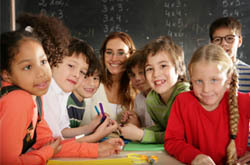 I also realize that a lot of parents are very supportive of what their kids do at school and reinforce it in the home, but it seems to me that parents are supporting the professionals and those teachers have ultimately accepted the role of being the primary academic teacher for the kids because they get paid to do it. Maybe there’s nothing wrong with that on an education level, but is there on a spiritual/church level? Thoughts? Is this a valid correlation?